One of the greatest hobby-related pleasures experienced by those who collect rare and early newspapers is finding previously unidentified content within an issue. While not on the same scale as finding gold, “mining” a newspaper for reports that were missed by the seller is certainly rewarding. Time and time again collectors tell us they purchased a newspaper for under $30 for a relatively minor report only to find a hidden gem buried deeper within the issue. Such discoveries, at times, can be financially rewarding, but in a world where the unexpected is often tethered to bad news, such relatively common incidents in the newspaper collecting hobby are a sweet salve to the weary soul (okay – perhaps a little overstated). Still, it certainly is to a seller’s advantage to keep such incidents to a minimum. Prior to offering a newspaper for sale, we compare it to various historical databases and our 40+ year chronological record of findings to help us estimate when a report of historical significance might be found. Since news traveled a bit more slowly in previous centuries, even our best intentions are left wanting. This being said, there are times when, as we go through the process of searching for historical content, what surprises us most is what we are unable to find – or the minimal coverage which is present. Its not that we miss the coverage, rather, its that what we now see as noteworthy events – often buoyed up by movies, history books, etc., were mere blips on the screen at the time they occurred, and the contemporary coverage only serves to confirm its position in the coverage food-chain of the day. The purchase of Alaska  from Russia, finalized on March 30, 1867, is such an event. After spending over an hour searching for a mention in a set of Springfield (MA) Republicans from 1867, coverage finally showed up on page five of the April 10th issue (see image). 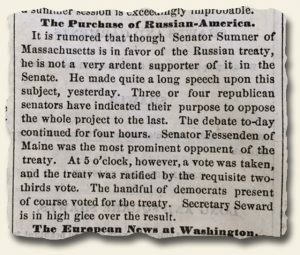 Perhaps this is why the purchase, promoted heavily by and signed by the U.S. Secretary of State at the time, William H. Seward , became known as “Seward’s Folly.” Of course just because many of his contemporaries thought paying 2 cents an acre was foolish doesn’t mean he was wrong. Sometimes the masses simply don’t get it right – as time would reveal.